Financial Justice is the untold story of how a diverse group of progressive organizations took on the powerful financial lobby, pushed Congress to create a strong new consumer protection agency (The Consumer Financial Protection Bureau), and against the odds, won. Financial Justice is the untold story of how a diverse group of progressive organizations took on the powerful financial lobby, pushed Congress to create a strong new consumer protection agency (The Consumer Financial Protection Bureau), and against the odds, won. Keys to the victory were Elizabeth Warren and a new umbrella entity called Americans for Financial Reform (AFR) led by two extraordinary organizers, Heather Booth and Lisa Donner. This very readable narrative by Larry Kirsch, an economist, and Professor Robert N. Mayer, a sociologist, begins after the 2008 election of Barack Obama and a nation facing the worst economic crisis since the Great Depression caused by four decades of government deregulation of the financial services industry. Americans were sold a flawed economic philosophy that claimed we need an “unfettered free market” to increase homeownership and bring about prosperity. Mortgage companies duped families into refinancing mortgages using deceptive sales practices and charged high-unregulated interest rates and fees. Wall Street firms packaged the sub-prime loans into exotic investments that few understood. Credit agencies cheated on the ratings. Democrats proposed the most comprehensive financial reform since the New Deal to avoid another crisis. 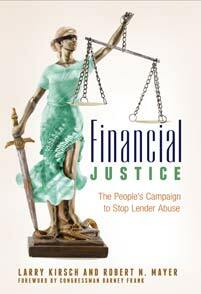 To police bank abuses they proposed a Consumer Financial Protection Agency (CFPB) as part of the comprehensive reform. It would require clear up-front banking prices visible, and not buried in fine print. The new agency would have autonomous power to write regulations governing everything from credit cards and overdraft fees to payday loans and mortgages. The agency’s regulatory authority would extend to banks and non-bank lenders such as tax preparers offering refund anticipation loans. The best and brightest executives from Goldman Sachs, and other Gordon Geckos of Wall Street who caused the world financial disaster, responded by paying themselves billions of dollars in bonuses and hundreds of millions on lobbyists to fight against the new agency and other reforms that would protect future borrowers from abuse. The U.S. Chamber of Commerce also bombarded members of Congress to weaken or ditch the CFPB. The people who had lost their homes, their housing wealth, their jobs, billions to taxpayer funded bailouts, and trillions in lost college and retirement savings needed a powerful voice. A few labor and citizen groups might mount efforts to get Congress to pass some democratic control over the financial sector, but scattered and localized were unlikely to be sufficient to win substantial reforms. Obama told the public that he was committed to strengthening the enforcement of regulations designed to oversee Wall Street, and he supported the idea of a new consumer-oriented agency to look after Main Street not Wall Street. But Warren, Booth and Donner knew that in a democracy dominated by powerful financial interests, you couldn’t rely on the President or Congress to fight populist battles on their own. The AFR became the national coalition of more than 200 consumer, employee, investor, community and civil rights organizations including USAction, AARP, ACORN, The National Council of La Raza, private financial firms like American Income Life Insurance Company, AFL-CIO, Common Cause, Consumer Federation of America, and Public Citizen. Successful passage of the Dodd-Frank Act with its landmark new consumer agency took a massive effort by Warren, the “policy entrepreneur;” and Booth and Donner, the brilliant lesser-known community organizers who kept the often unruly consumer activists focused. The version of the CFPB passed by congress reflected almost AFR’s entire “wish list,” with a few exceptions. Auto dealers managed to get themselves excluded from coverage by the CFPB. More important, the CFPB proposed by Obama would have included the enforcement of the Community Reinvestment Act (CRA), arguably the most important post-1970s reform for building wealth for the working-poor and revitalizing inner city neighborhoods. Lax enforcement by banking regulators had undermined the effectiveness of CRA, but the AFR was unable to incorporate the enforcement of the CRA into the CFPB. The authors should have explored why the AFR was unable to win the CRA reforms. I suspect it was directly connected to the Right’s ferocious attack against ACORN, an AFR member with the largest grassroots urban base fighting for financial reform and the failure of Democrats and progressive groups to circle the wagons to protect ACORN from the false attacks by Fox News and the right wing echo chamber. The authors do, however, succeed in making the kinds of compromises the group had to make over federal pre-emption and congressional procedure clear and even interesting. The book, based on solid research and interviews with Elizabeth Warren and campaign advocates, has fascinating chapters dealing with the legislative struggles showing how the activists held wavering members of Congress accountable for key votes, while addressing the larger issue of how social movements can contribute to progressive political change.